Join us in the chapel Sundays at 5 PM for a Mass that is quiet, reflective and draws from the great spiritual wisdom of Jesus in the gospels. Explore with us holy teaching and sacred music of other faith traditions, too. 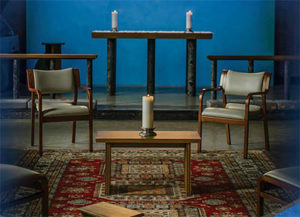 Come as you are, adopt the posture that’s most comfortable (yoga mats are welcome; chairs are available) and allow yourself to enter into a very different experience of God and Holy Communion.